an old abandoned church, meets a merchant's daughter, and an old gypsy woman who tells him to travel to the Pyramids to find his fortune. The Boy comes to Tangiers, meets an old man who gives him magic stones, and a charming stranger steals his money. The Boy gets a job at a crystal shop, meets a candy maker, joins a desert caravan, and encounters a curious English man. The Boy falls in love with the beautiful Fatima, and journeys further into the desert with the mysterious Alchemist. The Boy and the Alchemist witness battles between warring tribes and are captured by the Blue Men of the desert. 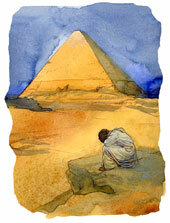 The Boy reaches the Pyramids only to find his treasure where the journey began.